Pregnant Snooki Trips in Platform Sandals! When Nicole "Snooki" Polizzi announced her pregnancy on the March 19 cover of Us Weekly, the MTV star proclaimed: "I&apos;m going to wear heels throughout. I&apos;m 24, not 50!" Bad idea. 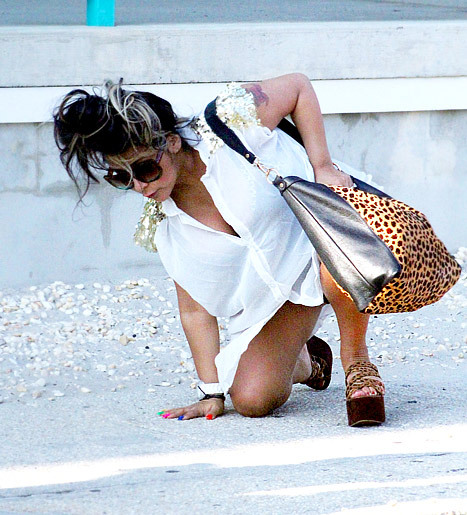 While filming the sixth season of Jersey Shore in Seaside Heights, New Jersey on June 21, the expectant star took a tumble in her platform sandals. Luckily, Polizzi wasn&apos;t seriously injured. While the pint-size star is hesitant to give up her sky-high heels, Polizzi did vow to stop visiting the tanning salon while pregnant. "I can use self-tanner, I think, but I don&apos;t feel the need to," the typically bronzed star told Us. "This is my pregnant look." Polizzi and her fiance, Jionni LaValle, 24, will welcome a baby boy later this year; they are planning to tie the knot in 2013. "We will focus on the baby first. I want to have the baby, lose weight and have the baby in the wedding," Polizzi explained. Added LaValle: "It&apos;s at least a year away." Like most brides-to-be, Polizzi has a clear vision of what she wants on her big day. "I want it in my church, with a reception in Jersey somewhere. I want bombs going off at the reception — fireworks, pyro," she told Us. "And I want a princess-type gown with a huge train."